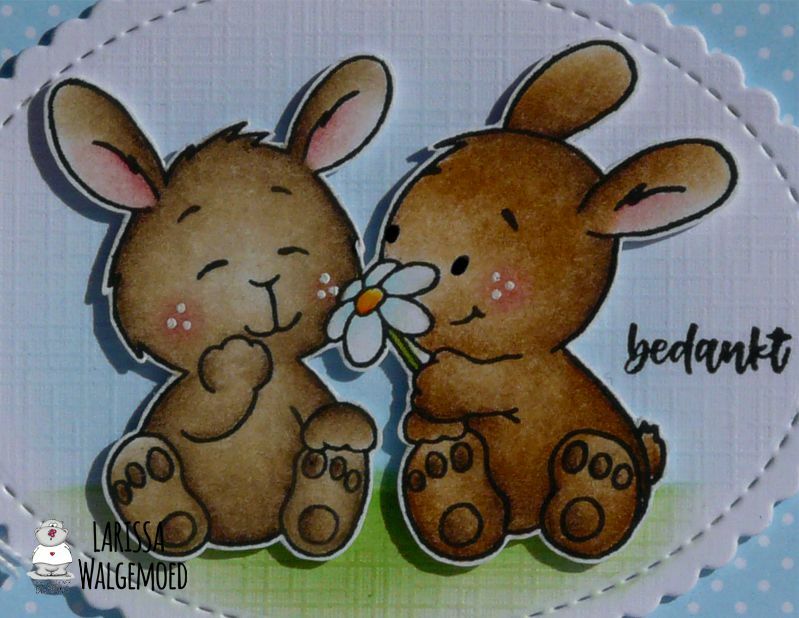 This time I made a card with the clear stamp set Bunny friends from Gerda Steiner designs. I have coloured the image with my Polychromos pencils, the black glaze pen and a white gelpen and then I have fussy cut the image. With the Mini scallop oval stax from My favorite things I have die-cut an oval from white cardstock. I used the Drifts and hills stencil from My favorite things and Tumbled glass and Mowed lawn distress ink to make a background for the image on the oval. With the Crea-nest-lies XXL 36 from Crealies I have die-cut a rectangle from blue dotted design paper from the Spots & stripes pastels paper pad from Sugar pea designs. From white cardstock I have die-cut a scalloped rectangle with the Crea-nest-lies XXL 56 from Crealies. I glued the rectangles on top of each other after I tied a white ribbon around the design paper. I used foamtape to attach the rectangles on a white card. I also used foamtape to glue the oval with image on the card. I stamped a sentiment (thank you) from the set Bulletjournal - Tekst diversen from Craft emotions next to the image.